I'm excited to announce that I'm now writing for In Retrospect magazine! 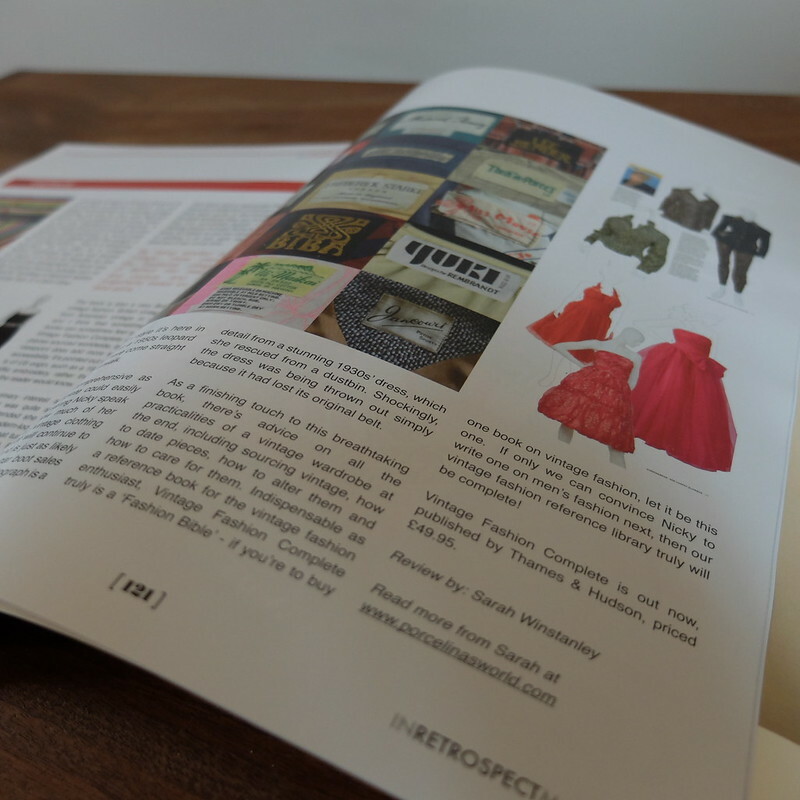 I contributed an article, reviewing the book 'Vintage Fashion Complete'. 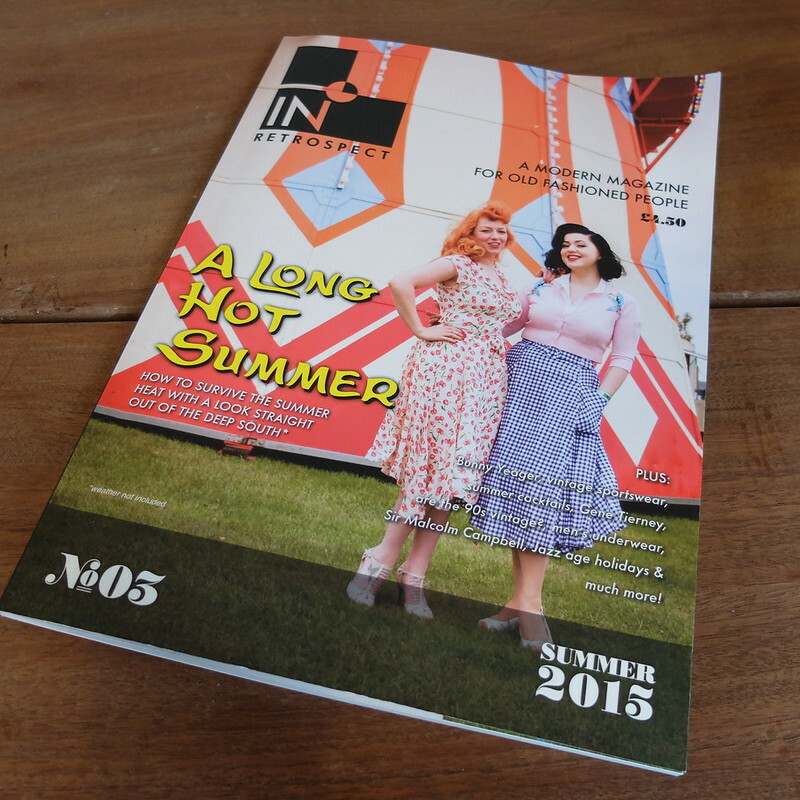 Do have a browse on their website, and if you order a copy you won't be disappointed as there are some fab articles, including a look at whether '90s is vintage, and a really good Deco travel piece by Mim. As for the weekend, it was more music and second-hand shopping. 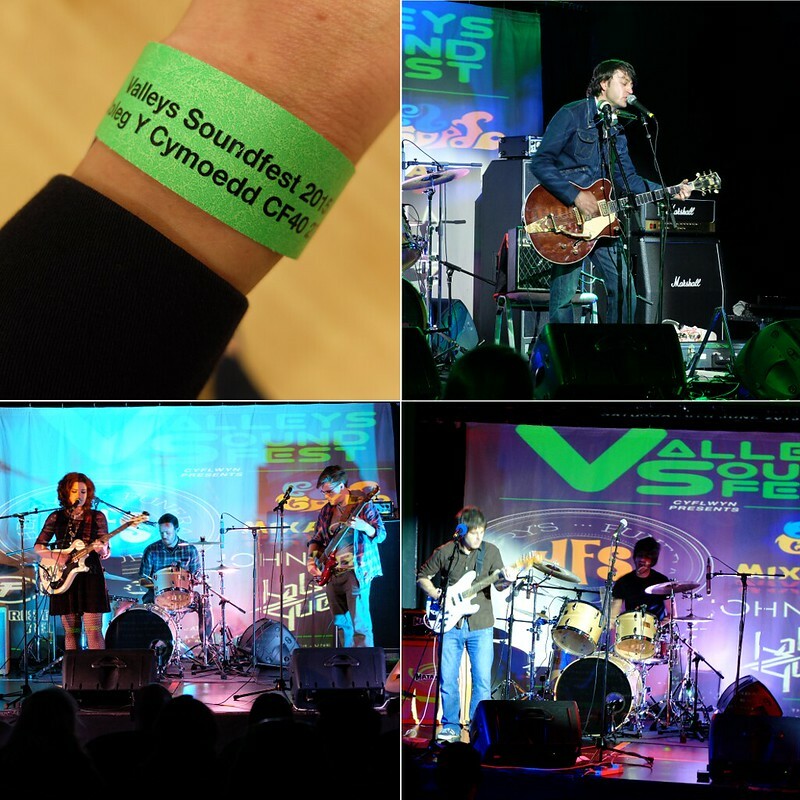 The local college students put on a fab little music festival each year, Valleys Sound Fest, and the husband-to-be was playing again, along with some other super local acts. Christopher Rees, Maddie Jones, and Henry's Funeral Shoe. As for the shopping side of things, I've done well in the charity shops and car boot sales lately. 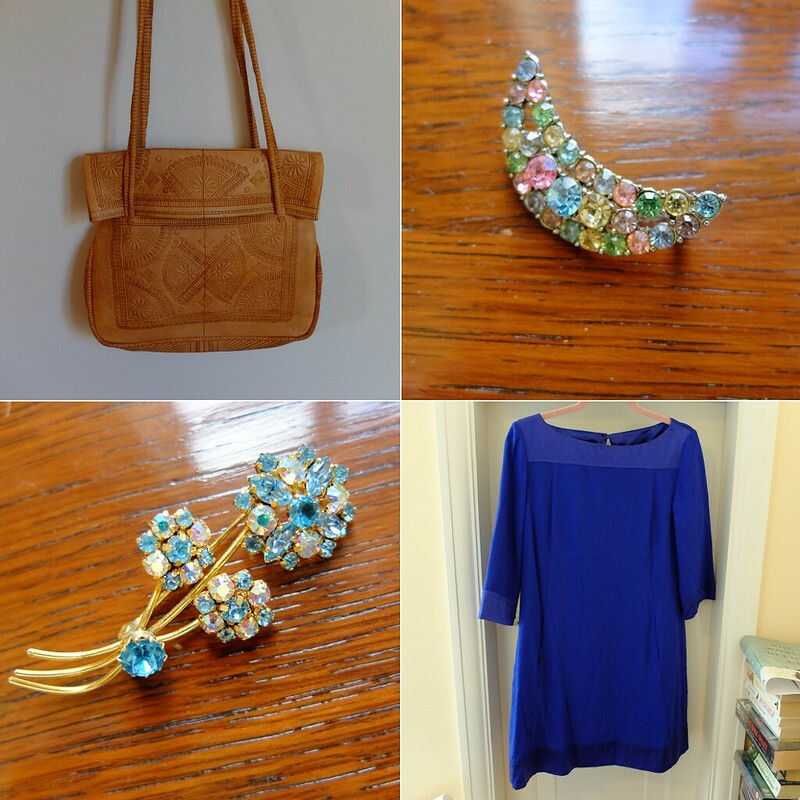 There's scant true 'vintage' around where I live, aside from brooches, which I'm inundanted with, so the vast majority of these purchases are modern items. 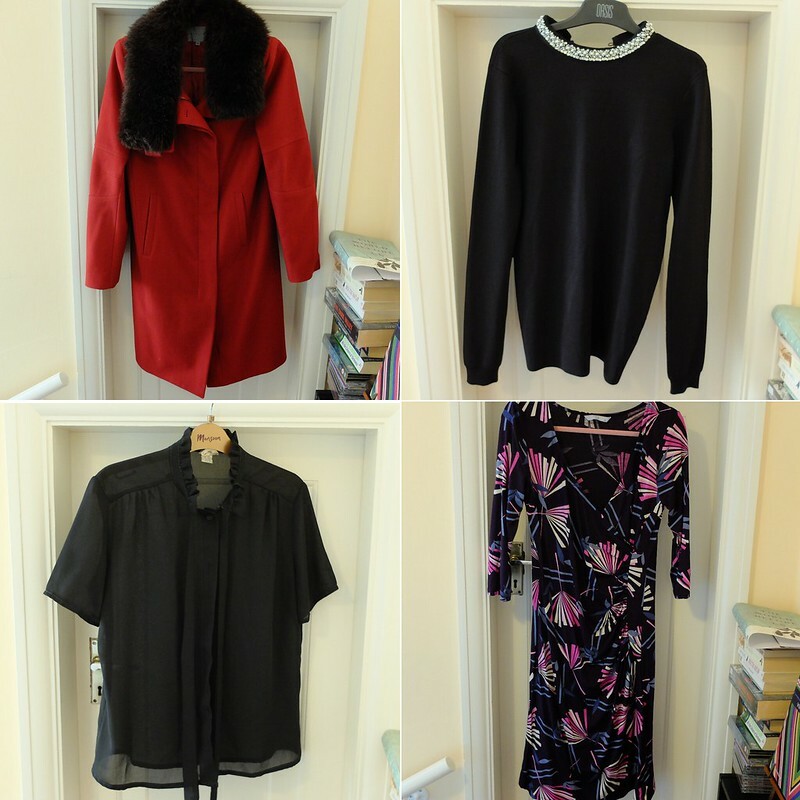 Clockwise from top left: Jigsaw faux fur collar cashmere coat, £8. Black embellished collar Asos top, £1, brand new with tags. Wrap dress, £1. Vintage (80s?) sheer top, £1. Clockwise from top left: Tooled leather bag, £1. Crescent brooch, free (they were throwing it out as it had a stone missing, so I rescued it and glued one in). Hobbs wool & silk shift dress, £5. Flower brooch, £2. 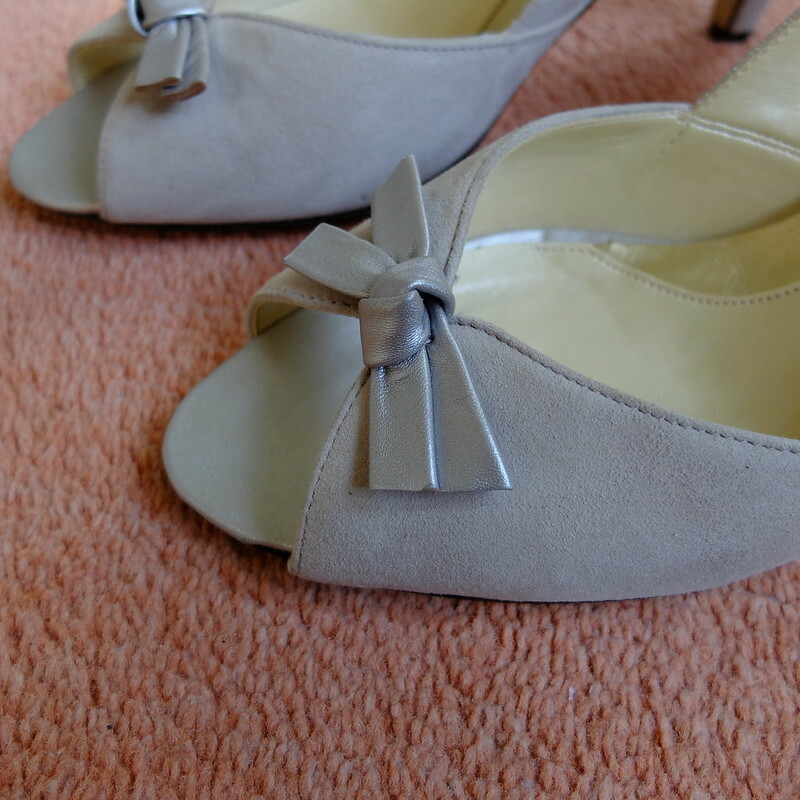 In further shopping news, I'm writing with bitter disappointment that the recently ordered 'Betsy' Agnes and Norman shoes off Ebay were far too narrow for me! Sigh. Back they went. 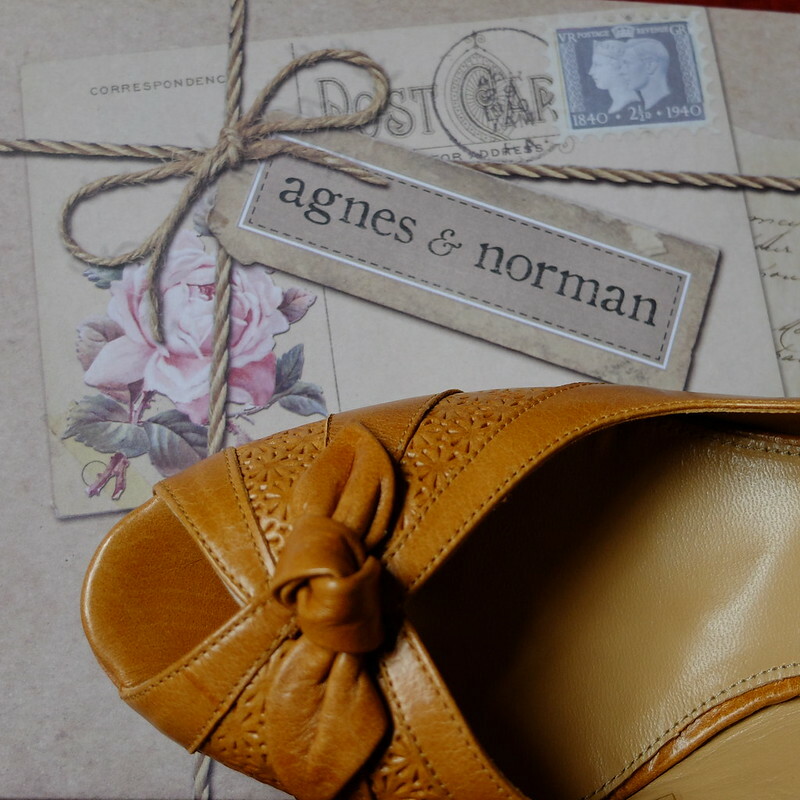 Agnes and Norman is the vintage inspired sister brand of Rachel Simpson wedding shoes, and as I own a pair of those that fit perfectly, I thought I'd be safe in ordering from the sister brand. Apparently not - a little Twitter conversation revealed that they use different sized lasts (shoe moulds) to make their shoes and there is subsequently some variation between styles. I've been after a new pair of peep-toes for a while, and it was with great delight that after that disappointment I came across a pair in TK Maxx by the brand Van Dal, a sort of upmarket shoe brand for an older age group, but this does mean that they have some really super classic styles and reissues of shoes they made back in the 1950s. At £12, I snapped them up. 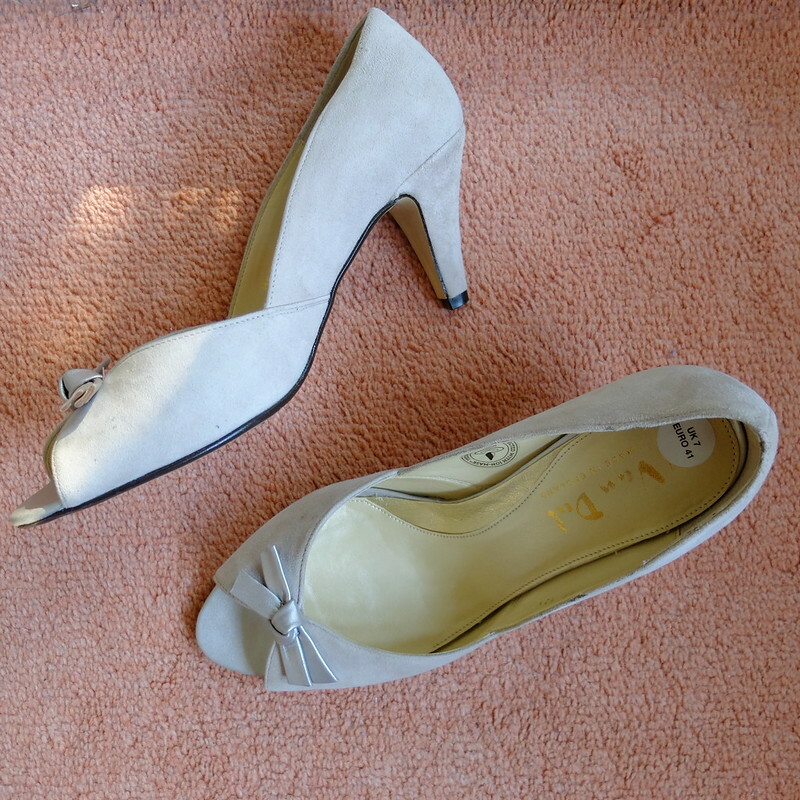 They're suede, so they're not the all-weather shoes I was after, but they are a good neutral colour to go with lots. Finally, I know some of you liked that coral maxi dress I recently wore, so I have another one, brand new with tags, in a size 10-12 up on Ebay with just a 99p starting price. I've been taking the plunge after encouragement from some of you, and have been ordering a few vintage maxi dresses off Ebay, so I'm hoping they'll turn out ok. The husband-to-be looked at the pics, and said, "hmm, they're of an era...", which I think is disapproval. I like them, so he'll have to put up with a more '70s me. I'm quite excited at embracing a new-to-me style! I can't stop buying them, it's an addiction!! The coat was a car boot sale bargain, the lady wanted £10 but I haggled. The pockets are still stitched up, so it's like new. I got another coat on Sunday, a nice wool one for 50p! The husband-to-be has also bought lots of coats recently, we need another coat cupboard. Sounds like a fun and fruitful weekend. I checked the online store and am so tempted by the vintage leather patchwork handbag. Sadly the cost of international shipping kills me. Congratulations on the magazine, that's so exciting! Funnily enough I was just looking on their website the other day. Both those broaches are beautiful, I really would like some more. Also, I am totally loving the maxi dresses on you, embrace the 70's! Yay! Great news about the mag. How exciting having your name in print. Congratulations on the magazine byline, that is really cool! It sounds like they have some interesting articles. Those peep toes that you found are too cute. 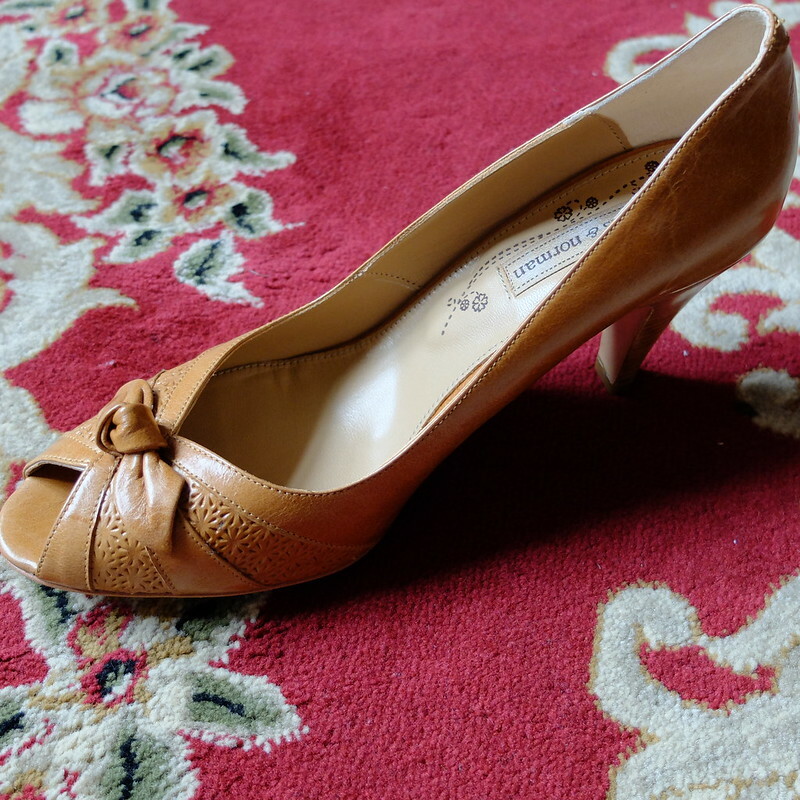 I love the shape and the practical little heel, they look like shoes that you could actually spend the day in. And hubby will just have to put up with 70s style you, because 70s style you looks amazing. That's fabulous, sweet dear, huge congratulations!! !